My "Mushrooms in Paris" Plate. This dinner was the first meal I prepared after we moved into our new place this past weekend. It was a flavorful Sunday night supper with some of my favorite ingredients: exotic mushrooms all peppered and sizzling, hot from the skillet. 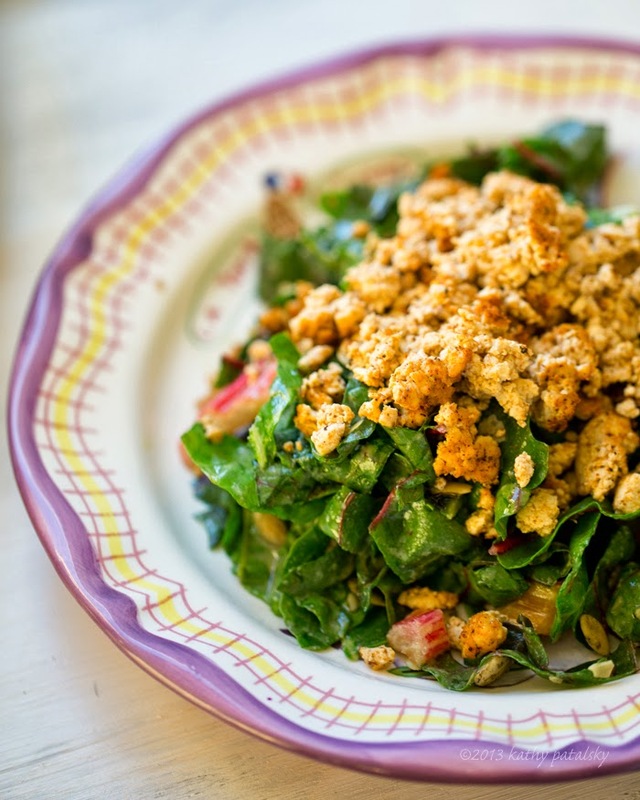 A sprinkling of raw salted pumpkin seeds, sweet rainbow chard, chopped and tossed in a light tahini-maple dressing and some spicy soy tofu crumbles too. Spices and accents of rosemary and garlic throughout. 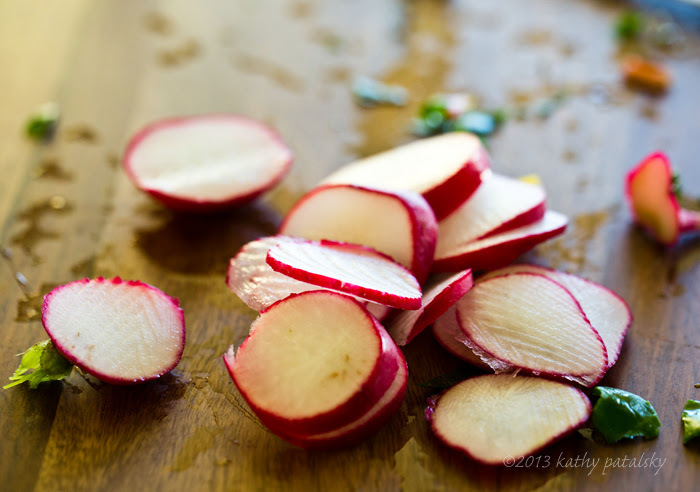 Crisp radishes complete this plate. I also whipped up a side of brown rice (not shown). 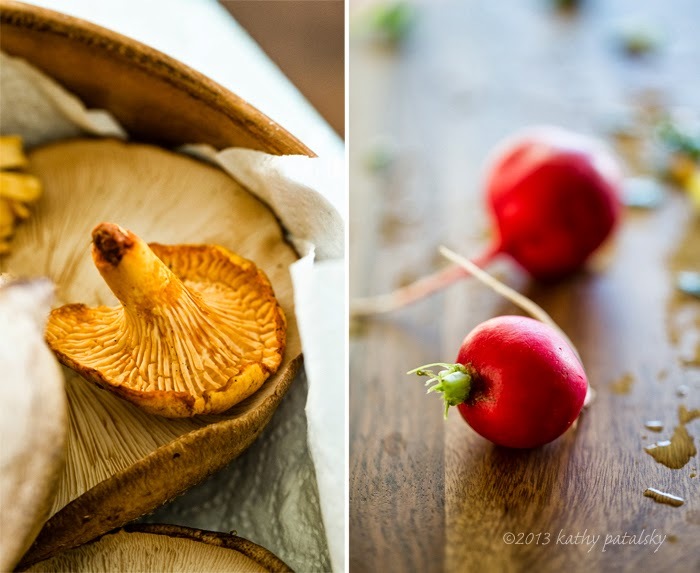 Mushrooms are so incredibly good for you, they help boost your immune system among other benefits, so I am always looking for new recipes to feature them in. This plate generously includes shiitakes (my favorite wellness mushroom) and an accent of chanterelles to make things a bit fancy. 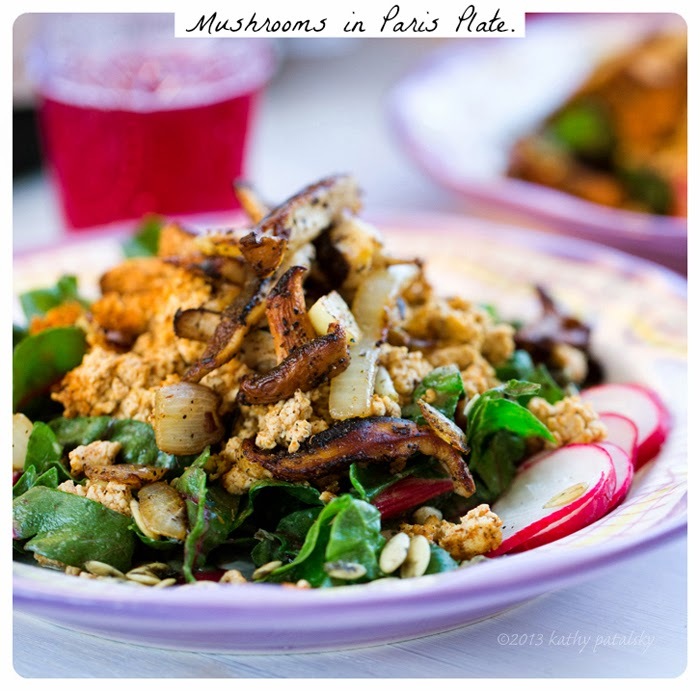 Get my Mushrooms in Paris Plate recipe and learn more about mushroom wellness and which mushrooms you probably shouldn't be eating.. Salad before adding the sizzling shrooms..
Paris Plate. This recipe doesn't have anything to do with Paris, really. 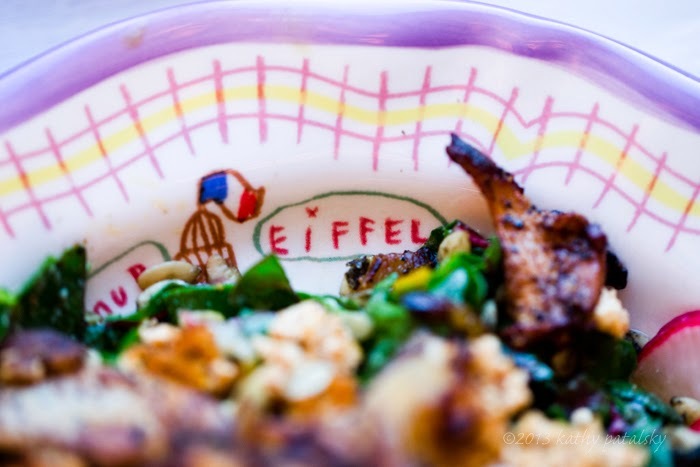 But if you look closely, you will see why I named this elegant entree my "Mushroom's in Paris Plate." 1) I always hated mushrooms growing up. But when my (then future) husband and I went on a trip to Paris, we had some mushrooms at a restaurant that overlooked the sparkling, twinkly-light-lit Tour de Eiffel. And boom. I became a mushroom lover. 2) Plate inspiration. These plates! I splurged on these gorgeous lavender-rimmed Anthro plates with the Eiffel Tower on them. Love. I think I buy more kitchen goodies than I do clothes at Anthropologie. 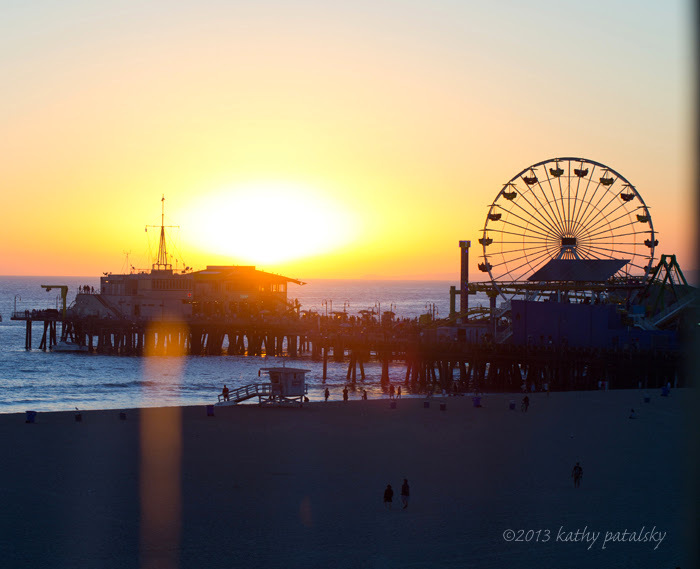 Side of sunset, optional, but very nice. "Shiitake: These meaty and flavorful mushrooms contain a substance called eritadenine, which encourages body tissues to absorb cholesterol and lower the amount circulating in the blood. 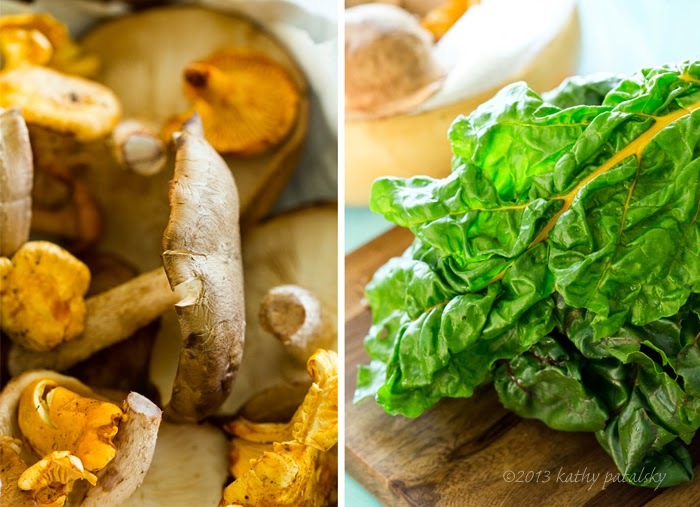 Shiitakes also have antiviral and anticancer effects." But did you know that those "white button" mushrooms may actually be bad for you? So when reaching for shrooms, Dr.Weil says you are best off choosing exotic varieties like Maitake, Shiitake, Enoki and Reishi. 1. 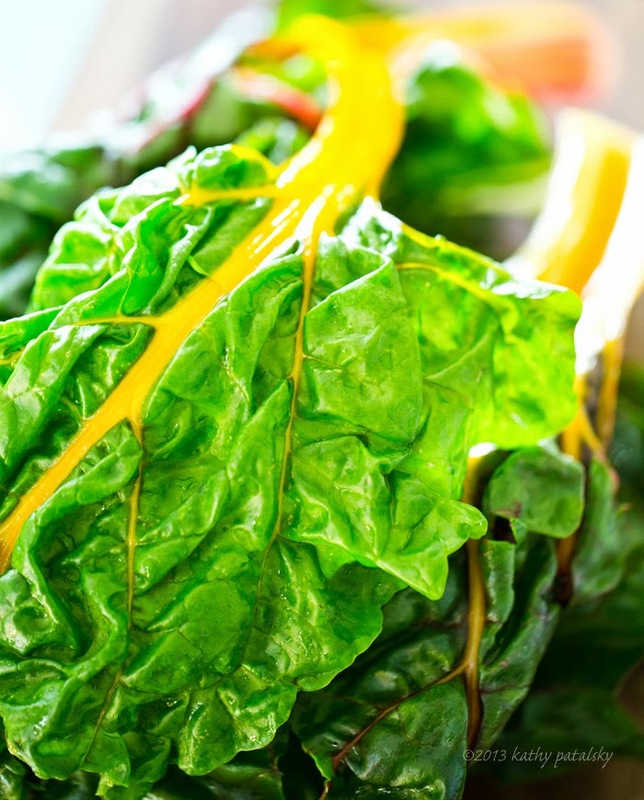 Start off by washing and drying your chard very well. Set aside on cutting board. 2. Turn oven to 300 degrees. If you are cooking rice, you will want to start that off first, since it usually takes about 30 minutes to prepare dry brown rice. 3. Grab your tofu and remove from package. Press tofu as dry as possible using a tofu press or a handful or paper towels or a clean/fresh dish towel. 4. Warm a skillet over a high heat burner with 1-2 tsp extra virgin olive oil in pan. When oil is hot, crumble in the tofu. Crumble by simply using your hands and fingers to break apart. 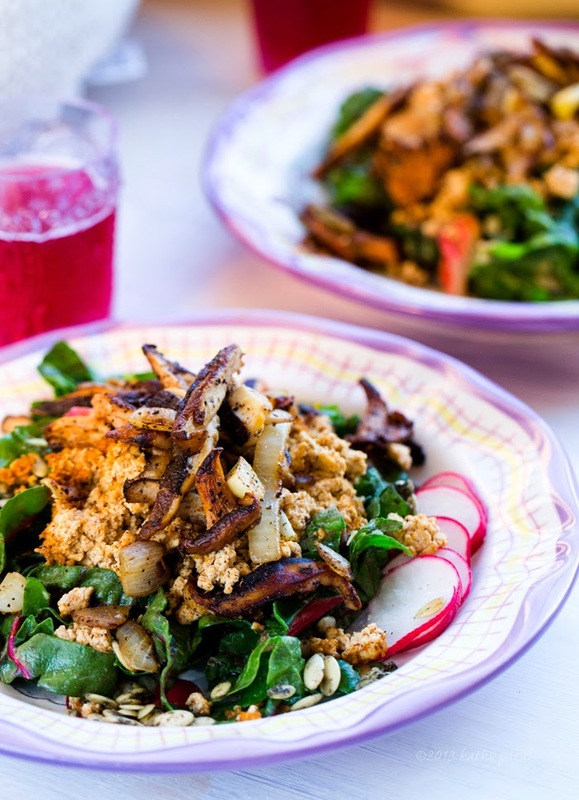 Using a spatula, you can further chop the tofu into small crumbly bits. 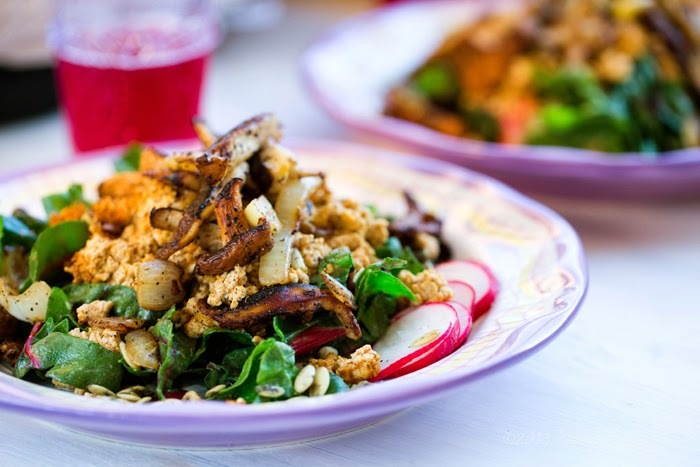 Season the tofu crumbles generously until every crumble looks spiced and seasoned. Salt to taste if the salt is not built into your spice blend. Saute and move scrambles around hot skillet for about 3-5 minutes. You can turn heat to medium if the edges start to burn. Cooking time will vary based on how wet your tofu was going into the pan. 5. When the tofu looks nice and crumbly and dry, remove from heat and transfer to an oven-safe dish. I used a glass pie plate. Allow the tofu to bake in a 300 degree oven for 15-20 minutes. Enough time to crisp the edges of the tofu a bit. For extra crispy bits you can toss the tofu mid-cook kind of like you would do when making homemade granola. (I just kept mine stable and the inside were still quite soft, which I liked. 6. 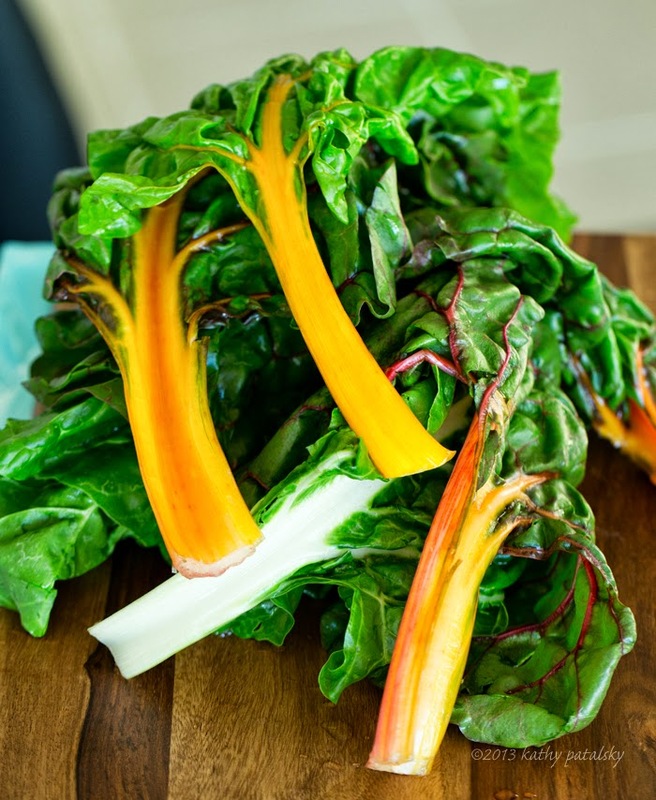 You can now chop your chard and add it to a large mixing bowl. Toss with the dressing until it is well marinated. Add to your serving bowl or plates. Sprinkle the pumpkin seeds over top. Set aside. 7. 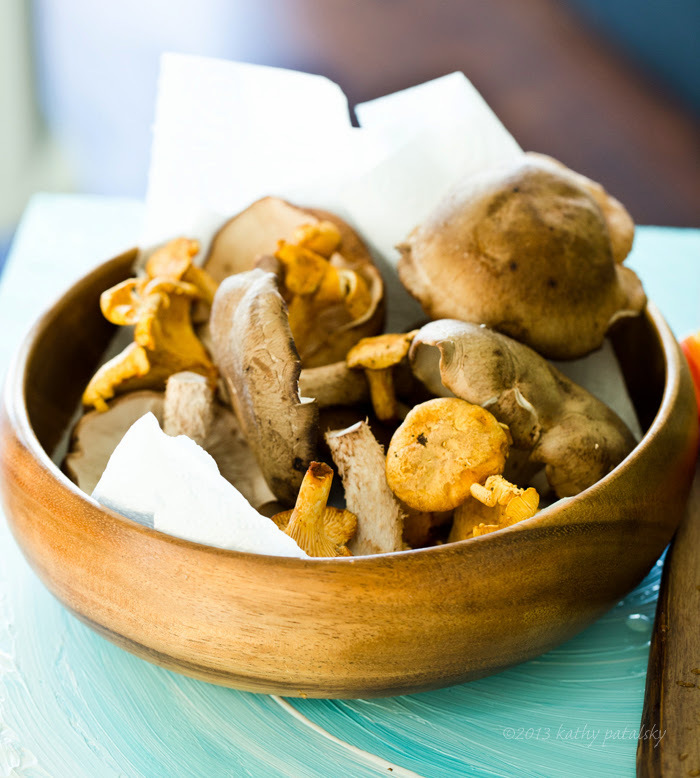 Mushrooms: Wash, dry and remove the woody stems of your shiitakes. If using a few chanterelles, rinse and dry. (Some people do not wash their shrooms since it "wets" them and they can be a bit soggier in the skillet, but I prefer to always wash them to remove any residue.) Heat your oil in a hot skillet over high heat. When oil is hot, add in the onions and cook for 1-2 minutes. Then add in your mushrooms, sprig of rosemary and garlic. Saute for 1-2 minutes. Then add a generous amount of pepper over top and a few pinches of salt. Your pan should be sizzling by now. Turn the heat to low or off and add in the vinegar or wine. (Big sizzle!) Toss a bit and turn the heat back up to high and cook until the liquid burns off and a few of the mushrooms look slightly crisp and blackened on the edges. 8. Plating: The layering goes like this.. chard, pumpkin seeds, tofu crumbles, mushrooms, optional rice on the side. Serve plated or in a big salad bowl for self-serving. 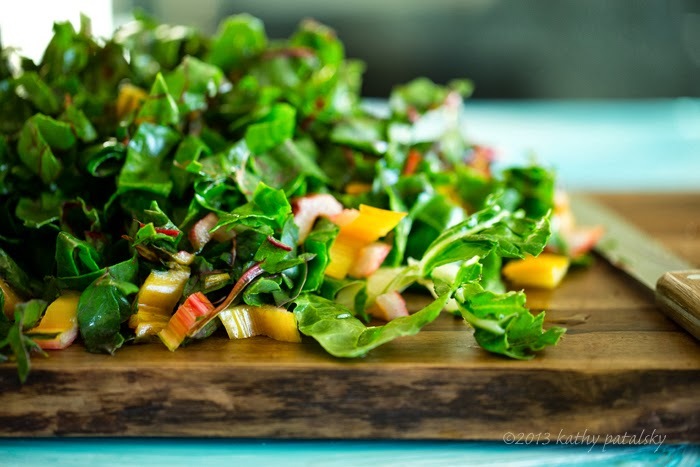 Eat right away so you get the heat from the warm components and crispness from the cool chard. Add a scoop of warm brown rice to the side if you'd like. I served with some gluten free rice toast with vegenaise and grape kombucha to sip.